I don't know about you guys, but i have a signature scent. I've been wearing the same perfume for over 10 years: J'Adore Dior Eau de Parfum. HOWEVER! I do like to switch it up and what i spritz on actually highly depends on my mood or what i'm wearing: it's just all about the general vibe. During the summer -- and i'm sure you can all relate -- i tend to crave lighter, fresh and crisp scents that are more relevant and simply better suited to the season. The heat can make a heavier perfume feel more stuffy, like the equivalent of wearing a jacket and scarf in the middle of july. Who wants to feel weighed down by their fragrance? 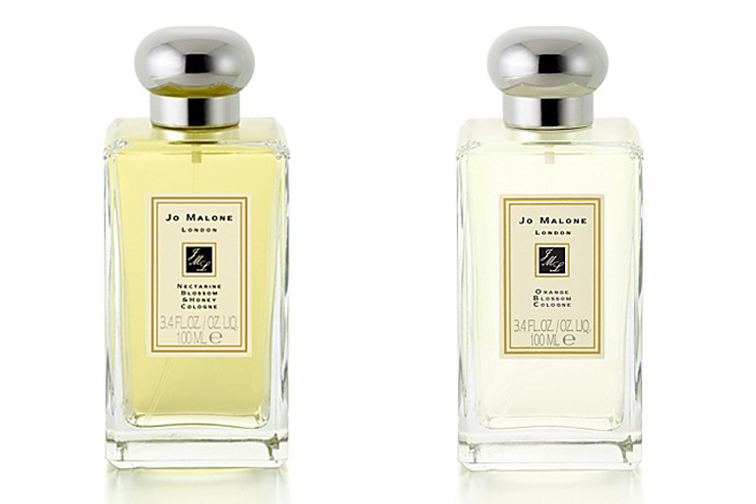 I'm going on my fourth summer with these two deliciously, perfectly light colognes from Jo Malone: Orange Blossom and Nectarine Blossom & Honey. They both have a clean, juicy aroma that transpire lightness upon first spritz. Catch but one whiff of yourself while wearing either and you'll be reminded that you're the best smelling person in the vicinity. Do you guys have a signature scent or do you prefer switching it up? Or both (like me!)? I have several perfumes, so I'm not always wearing the same ones! Am following you on Bloglovin now, will you maybe follow me back?